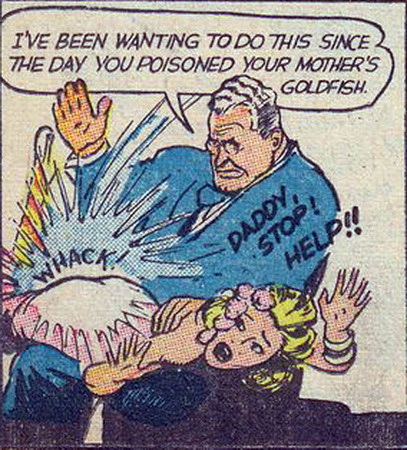 The original publication date of the third spanking in Dr. Bobbs is not yet known, but it was reprinted in Popular Comics #117 (November 1945), which means it was actually the first chronologically, appearing probably in 1942. 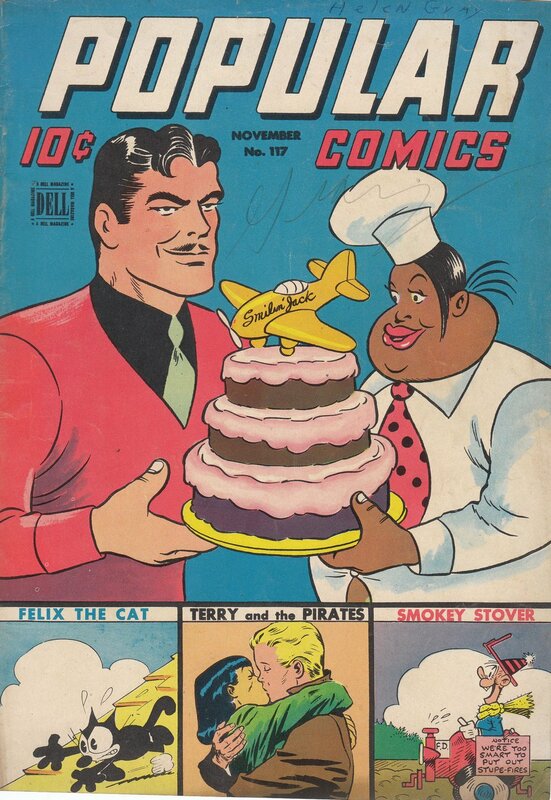 The front cover of Popular Comics #117 (November 1945). Published by Dell. 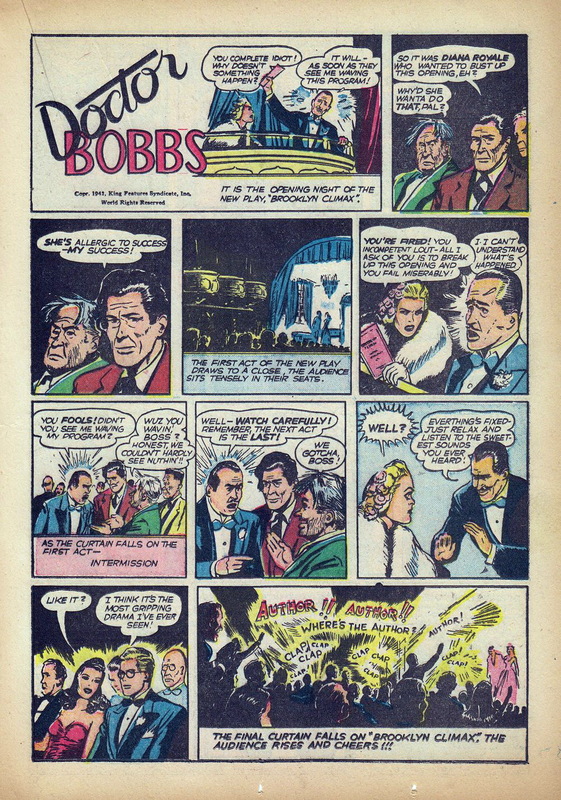 Interestingly, Dr. Bobbs was considered such a minor feature it wasn't even shown on the cover! By way of contrast, Smilin' Jack, well known to CSR readers for its many spankings (start here if you've never seen them) is prominently displayed. The story is rather conventional, with the rich, spoiled, and basically rotten Diana Royale	receiving a long-overdue spanking from her father. We see her in the first panel apparently having plotted to disrupt the performance of the play "Brooklyn Climax" by a man named Justin Haggerty. Somehow Haggerty has convinced the two hired thugs not to go through with the plan. "Gripping drama" perhaps - but not as gripping as what's going to happen to Diana Royale! The play is a big success, and Haggerty thanks Bobbs for his friendship and support. It emerges that the play's financial backer was none other than Mr. Royale, Diana's father. Diana Royale finally gets the spanking she deserves - and it runs for at least three panels! Diana Royale gets a royal spanking! 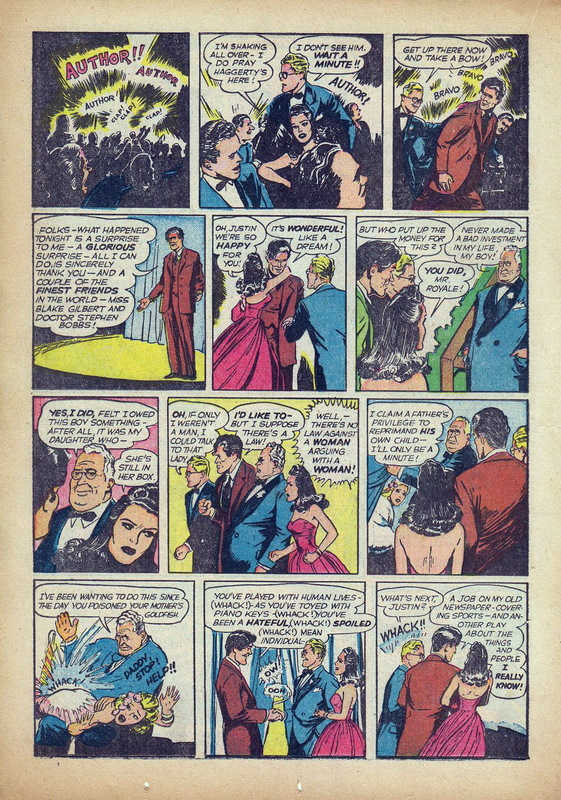 Script by Elliott Caplin; art by Jim McArdle. Originally published by King Features Syndicate. Posted by the Web-Ed on 04/12/2018. The spanking panel isn't bad, with fair OTK positioning. As we saw in the first two spankings from this strip, artist Jim McArdle (the King Feature Syndicate's choice when the strip was just getting off the ground) was not an exceptional talent although he did a decent job. The "Ow!" and "Ooh!" in the next panel, along with six "Whack! "s, embellish the scene nicely.